FYI SOUTH Magazine, January 2007. 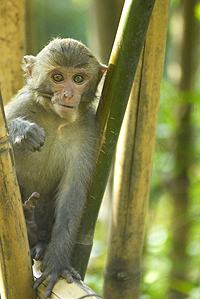 The Formosan Macaque's (Macaca Cyclopis) original stomping grounds extended from the lowlands to around 3,000 meters above sea level in southern Taiwan. Now, due to human overcrowding, hunting and pollution, these monkeys are hard to spot. 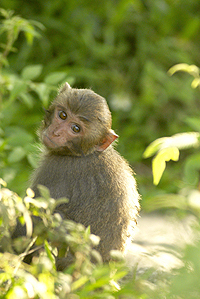 But, thanks to the efforts of Mr. Lin, who started taking care of Formosan Macaques in 1989, we can still observe them in their natural habitat. 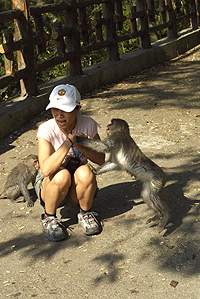 Straddling the Tainan County/Kaohsiung County border in Nanhua Township is Mr. Lin's Wushan Monkey Conservation Area. To get there, take Taiwan Highway 3 to Nanhua (which is south of Yujing and north of Cishan), then turn up Road 176 or Road 176-2. Signs along both these roads will lead you to the privately-owned monkey area. 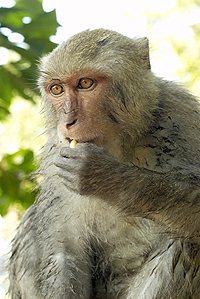 There's no admission charge, but food for the monkeys and refreshments for visitors are sold to help support the reserve. 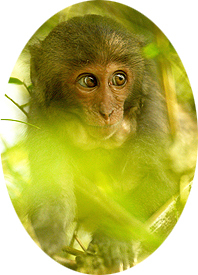 Weighing in at four to seven kilograms, with a body length of 40 to 65 centimeters and a tail extending a further 35 to 45 centimeters, the macaque is not particularly large. But don't underestimate them-they are wild animals. When feeding, hide the bag of food, or they will jump on you and steal it. Also, hold tight onto your valuables like keys, purses and wallets, as the monkeys like to steal interesting things from people. Note that bringing your own food to feed the animals is not allowed, as their diet needs to be controlled. There are some great hikes around here, notably the Wushan Health Trail. This path links the monkey reserve with the Southern Cross-Island Highway and you'll probably see many many macaques in their natural habitat here.